The Jamaican "Magician" wins again! 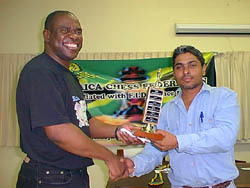 Pete Myers, "Matthews takes Frederick Cameron Chess Open," 14 December 2004 (Kingston, Jamaica). National Master Shane Matthews pocketed his first major title of the year, when he won the 2004 staging of the Frederick Cameron Chess Open at the Norman Manley Law School over the weekend. Matthews, who has been inactive for much of the year, defeated Jamaica's number one ranked player and reigning National Champion, FIDE Master Warren Elliott in the final round to end the tournament unbeaten on 5½ points from 6 games. National Master Shane Matthews (right) accepts the winner's trophy from JCF President Ian Wilkinson. National Masters Duane Rowe and Geoffrey Byfield both finished on 4½, but Rowe took second place on tiebreak. The best female prize in the Open section went to National Women's Champion Deborah Richards, best Junior was National Junior Champion Brandon Wilson, while the top rural player was Rayon Smith. The Amateur Section was won by 16-year-old Glenmuir High student David Morgan who was perfect with 6 points from 6 games. Second place went to Onaje Lamont who also hails from Glenmuir, while third went to Damion Davy of Camperdown High. The Women's section was won by Stephanie Ewbank of Immaculate High, who scored a perfect 6 points from six games. The tournament had 84 competitors and was co-sponsored by the Norman Manley Law School and the Jamaica Chess Federation (JCF). The next Open Chess Tournament to be staged by the Jamaica Chess Federation will be the New Years Open scheduled for January 2005.